Today, in great moments in getting ahead of ourselves: CC Sabathia told George King he is “pretty sure” he will retire if the Yankees win the World Series this year. “I want one more parade and pretty sure that will be it. I thought I had it last year … That’s what you play for. But you got to get it first,” he said. Sabathia is already the all-time strikeout leader among left-handed pitchers in the American League, which is pretty incredible. Based on the way he’s pitching right now and the way he’s reinvented himself, it seems Sabathia may have a few good years left, but he does have a bad knee and he may not want to hang on too long and grind through an ugly final season a la countless others. Whenever Sabathia does retire, he’s going to be an interesting Hall of Fame case. He’s probably not getting to 300 wins and might not get to 3,000 strikeouts — strikeouts aren’t really his thing these days (18.0 K% and 6.4 K/9) — and despite winning a Cy Young, there was never really a stretch where he was the best pitcher in the league. He was just really good for a really long time, similar to Mike Mussina. Monument Park will be an interesting case too. Sabathia is fifth on the Yankees’ all-time strikeout list — he should pass Red Ruffing and move into fourth place behind Andy Pettitte, Whitey Ford, and Ron Guidry sometime around the All-Star break — but he’s not top ten in wins, innings, ERA, or WAR. He was the ace of a World Series team though, and has been a great Yankee on and off the field. For now, Sabathia currently owns a 1.39 ERA (3.59 FIP) through six starts and for whatever reason I find his late career craftiness more enjoyable to watch than his peak power dominance. Something about the lovable Sabathia reinventing himself is endearing. The Yankees are very good and a legitimate World Series contender. 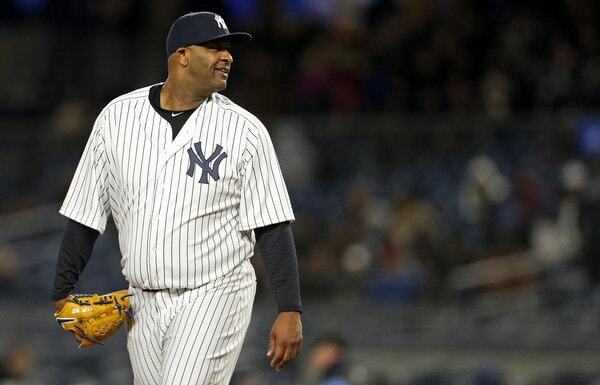 If they win a title and Sabathia rides off into the sunset, it’ll be a hell of a way for the big man to go out.